If you would prefer substitution of the new Maximum Vitality ESP for no additional cost, please make a note in the comments section of your order. Now with Biom3ga™ Krill Oil! Aging has been called a monumental, progressive deficiency disease. Its cumulative affect begins to appear in adulthood, picks up in middle age and takes a giant leap after age fifty. You can prevent and correct aging to an amazing extent by balancing your diet with Omega-3 oils and taking antioxidants, vitamins, minerals and other supplements. These are the supplements and recommended dosage that will help you maintain a youthful image, help maintain your weight, and give you natural energy. 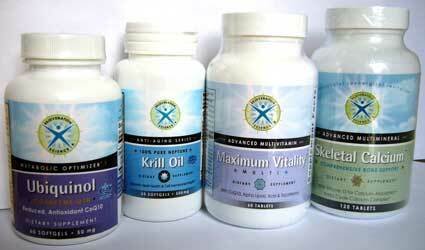 They will help your internal body systems to maintain health and youthfulness as well. These synergistic supplements help minimize free radical damage associated with modern lifestyles and conveniences. A successful anti-aging program requires exercise and a healthy lifestyle. Each Premium Anti-Aging component represents the latest research and most efficacious form: Maximum Vitality® is the top-value multivitamin in a study of 1,600 multivitamins in the U.S. and Canada; Biom3ga™ Krill Oil, gram for gram, provides up to 24 times the clinical results of high-quality omega-3 fish oils, Ubiquinol increases serum CoQ10 levels up to 8x more than standard CoQ10; Skeletal Calcium™ provides magnesium and related minerals and nutrients to ensure optimal uptake and utilization. The daily dose is described above. Taking as a divided dose is best, meaning split the dose - about 1/2 with your morning meal and 1/2 with your evening meal. It is best to take the CoQ10 - Ubiquinol in the morning because it gives you energy. Please see the individual bottle descriptions for details on each component.